Raw materials form the basis of any product and thus we obtain them after checking against varied quality parameters. Moreover, we procure raw materials only from reliable sources. We are working in close coordination with the team members and management; they make every endeavor to keep the products piled up safely in our capacious warehouse. By this, we make deliveries in the committed time span. Restore Strength Stamina And Provide Resistance Power Against Diseases. Helps The Body To Recuperate After Illness. Salab Misri:This Potent Herb Enriched With Astringent,Demulcent,Expectorant Nutritive And Restorative Properties Improves The Overall Well Being Of A Person It Also Helps In Nourishing Brain Cells And Improving The Concentration Power. Balchar: Balchad Can Be Used Internally As Well As Externally. The Roots Of The Herb Balchad Tone The Brain And Stabilize Mental Ability. It Is An Excellent Tonic As It Helps To Subside All The Three Humors. It Is A Well-Known Brain Tonic And Imparts A Sense Of Calm And Peace To Mind. Withania Somnifera (ASGAND) : Highly Esteemed As An Adaptogen And A Rejuvenating Herb,Capable Of Imparting Long Life,Youthful Vigour And Good Intellectual Powers,Promotes The Body’s Ability To Maintain Homeostasis And Resist Stress. Emblica Officinalis (AAMLA ): Acts As Anti-Bacterial And Resistance Building,Best Medicine For Premature Aging,Regular Usage Leads To Rejuvenation Of The Body,Increase Memory And Improves Eyesight. Dosage : Direction Of Use : 2 Tea Spoons Twice A Day After Meal And As Directed By The Physician. 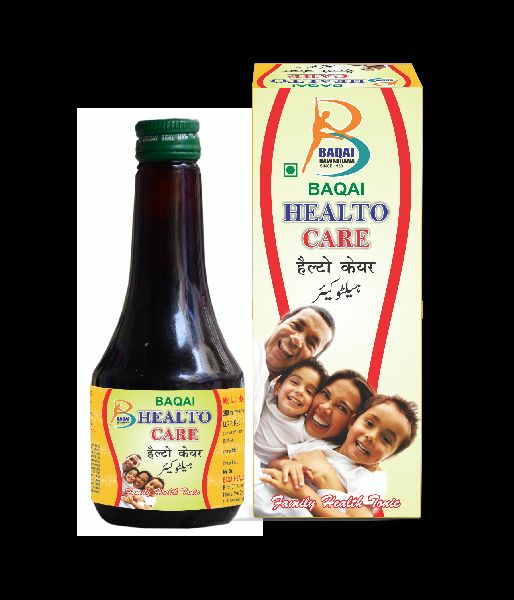 Side Effects : Baqai Healto Care Is Not Known To Have Any Side Effects.